Cleaning up the yard and getting the fertilizer ready for a weed free and beautiful green lawn sounds good this time of year. This is similar to your internal body, we clean our homes, our cars, and our lawns, and sometimes obsessively cleaning, that’s great but what how about cleaning your insides like your gut? Probiotis are the good bacteria in fermented foods like kefir and adding chia seeds support the population of your gut with immune boosting and to support your healthy microorganisms to thrive. 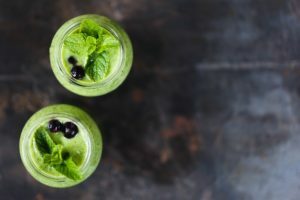 Here is a basic way you can introduce healthy bacteria into your gut and enjoy drinking it at the same time, guilt free. 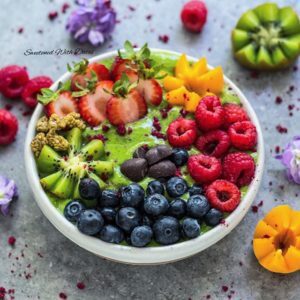 Ingredients 1 cup coconut kefir, 1 cup of coconut milk, 1/2 tsp vanilla extract, 1/4 cup chia seeds, 1 banana, 1 cup mixed berries, 1 cup fresh greens, mint leaf for garnish and powered cinammon. Directions 1) Place the coconut kefir, coconut milk, vanilla, chia seeds, banana, berries and greens in the blender and turn on. Gradually increasing the speed, blending for 10-20 seconds. Pour into a desired glass and top it with the mint leaf and cinnamon, drink and enjoy. Cheers to a happy gut!